Since 2008 until very recenty, the U.S. South had had the best figures in terms of sawmilling industry sales. The ongoing decline in foreign currency exchange rates of major producing and exporting regions against the U.S. dollar caused a massive erosion of lumber prices in many markets around the world. Nevertheless, the situation on some markets has changed dramatically. As International Wood Markets emphasizes in its 2015 Global Cost Benchmarking Report, the Russian ruble saw a 50% reduction (2014 average vs. Q1/2015 average) and this contributed to the Russian sawmills facing major cost reductions as well as soaring lumber revenues in U.S. dollar terms. Wood Markets’ survey took into consideration 32 countries and/or regions. Among them, U.S. South and Russian mills accounted for 6 of the top 8 positions in terms of earnings (EBITDA) at top-quartile mills. The global EBITDA average in 2014 for top-quartile mills was double that of 2012 on the strength of improved lumber markets, stable global economic conditions and a slow strengthening of the U.S. dollar. On the North-Amercian scene, U.S. mills are still getting better overall earnings than the Canadian ones. As the Wood Markets underlines, the Softwood Lumber Agreement (SLA) is likely to be a key factor. The U.S. South sawmills performed best. Currently, Canadian mills have to face rather low lumber prices. Despite this, local producers may see better earning with the local currency getting weaker agains the U.S. dollar and the non-renewal of the SLA starting on October 12, 2015, says International Wood Markets’ President Russell Taylor. In Q1/2015, good earnings seen by North American mills, slid down due to weak demand, declining lumber prices, and excess production. The downward tendency continued both into Q2 and Q3 of 2015. Regardless, the U.S. South remained the highest margin region in the world in Q1/2015. Russia’s best mills have been improving their results in each global survey over the last four years, says Wood Markets. Mostly driven by curriency fluctuations, mills reached top earnings in 2014. Buyers were able to quickly push Russian lumber prices lower in US-dollar terms, especially in China. Thus, in 2014 and Q1/2015, overall earnings of the Russian and U.S. mills were approximately on the same level. “With a huge windfall of cash, a number of Russian sawmill companies have embarked on capital spending programs to create higher production, lower cost mills, not to mention considerable investments in lower cost Scandinavian logging equipment.” commented Russell Taylor cited in Wood Markets’ press-release. Despite the rapid weakness in the euro relative to the U.S. dollar, European sawmills weakened through into Q1/2015. Earlier on, they managed to improve moderately over the disastrous results of 2012. A similar tendency was observed in the Southern Hemisphere regions (Australia, New Zealand, Chile, Brazil and South Africa): better results over 2012 earnings, but general weakness in Q1/2015. SINCE the financial crisis, the tide of recovery has not lifted all boats equally. But in few industries is that more true than in shipping. Demand for oil tankers has boomed: a combination of weak spot prices and higher futures prices, driven by the assumption that supply and demand for crude will eventually rebalance, has encouraged traders to hire tankers to store oil at sea and cash in on the price gap. Meanwhile, bulk carriers, which carry such things as iron ore and coal, have been hit by massive overcapacity, as Chinese demand for such commodities has collapsed (see article). Until the start of this year, the container-shipping business—which carries around 60% by value of all seaborne trade in goods—looked more like that for oil tankers. Rising global trade volumes, and firm steel prices that made it worthwhile for owners to scrap old ships, had kept capacity in check, and container-freight rates seemed to be steadying. As recently as August last year, demand for container shipping was so high that BIMCO, an industry association, was warning of a capacity shortage. And at the start of this year Drewry, a shipping consultant, forecast a bumper year: owners of boxships would rake in profits of up to $8 billion in 2015, they thought, helped by low fuel costs. But since then the industry has been rattled by renewed weakness in freight rates, prompted by a fall in the volume of seaborne trade. 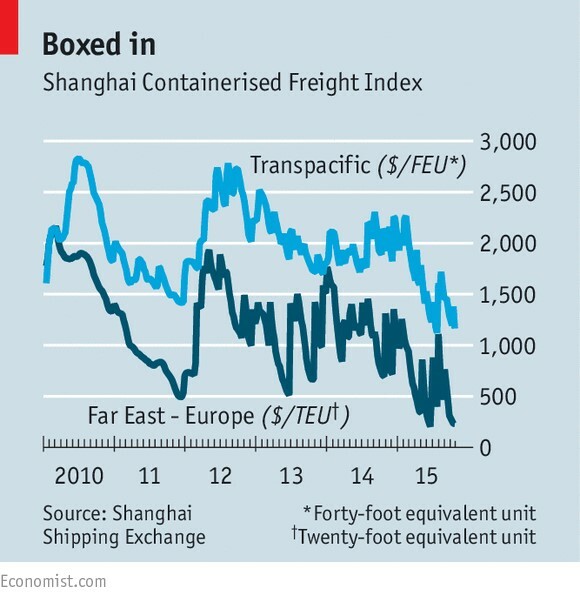 The cost of sending a container from Shanghai to Europe, for instance, has almost halved since March, according to the Chinese city’s shipping exchange (see chart). And the absence of the usual pre-Christmas pick-up is worrying both analysts and investors, according to Rahul Kapoor of Drewry. On October 23rd Maersk, the world’s largest container line, told investors to brace themselves for a fall in profits when it announces its third-quarter figures on November 6th. Some of the shipping lines’ problems are due to factors beyond their control. At a time when weak trade volumes should be prompting them to scrap more old vessels, the steel price has slumped. So, 60% fewer boxships have been scrapped so far this year compared with the same period last year. However, some shipping groups have made a rod for their backs by taking on too much debt. This also makes it hard for them to scrap unprofitable vessels, since their balance-sheets would struggle to cope with the resulting writedowns. Worse still, critics say, is that shipowners have embarked upon a building boom. Orders for new container ships were 60% higher in the first five months of this year, than in the same period in 2014, according to Alphaliner, a data provider. In June Maersk ordered 11 ships that can each carry up to 20,000 standard-sized containers, in a deal worth $1.8 billion. 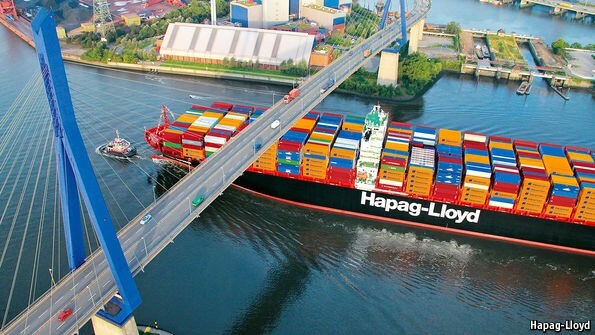 Next week Hapag-Lloyd, another operator, plans to raise $300m by floating on Frankfurt’s stock exchange, to help pay for six giant new ships, ensuring that it stays in the game. Hapag-Lloyd has had to delay its IPO a week because demand for the shares has been so weak. And investors have good reasons to be hesitant. All the extra capacity should depress rates further, adding to the industry’s problems. But for those lines that can afford it, ordering big, new ships may be a sensible reaction to falling freight rates. There are still sizeable economies to be gained from increasing the size of vessels. As Hapag-Lloyd’s boss, Rolf Habben-Jansen, recently pointed out, a ship capable of carrying 19,200 containers needs half as much fuel to shift each box by one mile as a vessel with a capacity of 4,900. 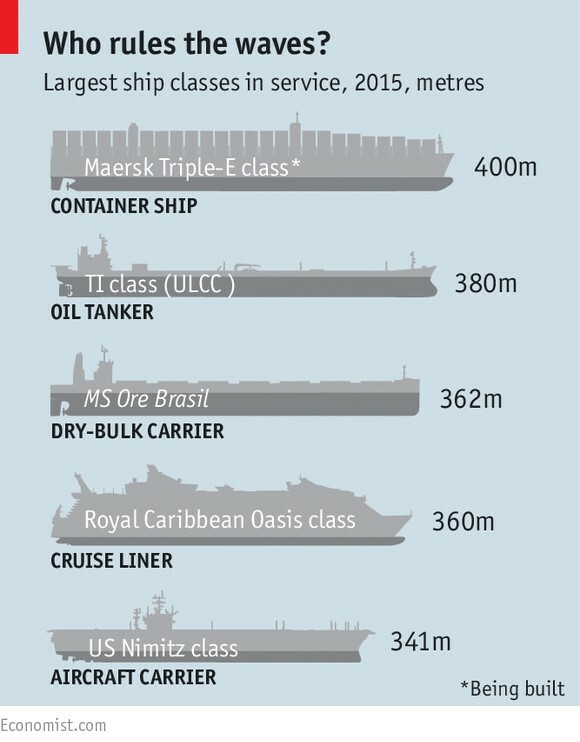 As a result, the capacity of the largest container ships afloat has risen from around 14,000 before the financial crisis to just under 20,000 today—and boxships are taking the place of oil supertankers as the giants of the seas (see diagram). Among the winners from this flight to scale will be the world’s largest three lines—Maersk, Mediterranean Shipping Company (MSC) and CMA CGM. They have the industry’s lowest costs, because they have the biggest ships and the cheapest finance costs. They also have the advantage of being based in Europe: demand to transport goods across the Atlantic has remained strong. Analysts expect the big three to stay profitable over the next few tough quarters, even as their revenues fall. Maersk and MSC have also formed an alliance, 2M, to save more money by sharing space on their ships on transatlantic and transpacific routes. As the strongest lines get stronger, through fleet renewal and alliance-building, smaller lines that cannot cut their costs quickly enough or obtain cheaper finance to build bigger ships will suffer. China’s two biggest lines, China Shipping Group and Cosco, were losing money before the current downturn started. They have recently swung back into profit, but only thanks to generous state aid to help them scrap old vessels. The government regards it as vital to have a national merchant fleet, so it will not let the two go to the wall. But it plans to merge them to save money, and to stamp out corruption at Cosco which, according to internal documents leaked this week, is another reason for its poor performance. The hardest hit, however, will be the smallest container lines that do not enjoy state backing. Several smaller Japanese and South Korean operators, in particular, are sailing close to bankruptcy, analysts say. The pressure to cut costs is also hitting container lines’ suppliers; several shipping-services firms in Denmark and container-logistics firms in Britain have gone bust in the past year. The move towards ever bigger vessels poses a risk to ports which lack the capacity to handle them. International trade is shifting towards big, centralised hubs. And smaller ports, somewhat like smaller airports when the hub-and-spoke model for long-haul flights became dominant, are losing many of their direct connections. This has already happened at Portland on America’s west coast, which is no longer served by any regular container routes. To avoid this fate, port authorities in some countries are now investing heavily in upgrading their infrastructure, to handle larger vessels. Recent development projects in Liverpool and London have already brought traffic back to those British ports. In a similar vein, Indonesia announced details of a $3.6 billion project to upgrade its container ports earlier this month, to ensure it does not lose routes to Singapore, the nearest big hub. As falling volumes and weak shipping rates force the industry to consolidate, with fewer, bigger lines sailing ever-larger ships to fewer, bigger ports, the resulting gains in efficiency should mean cheaper transport costs, bringing benefits for consumers in many places. That is, unless the consolidation goes too far, and the surviving lines are able to jack up their rates. The 2M alliance now controls more than 28% of global container-shipping capacity, and almost a third on the Europe-to-Asia route. Regulators are already worried about the impact on competition: in June last year, the Chinese authorities vetoed plans for a larger alliance, called P3, that would have involved all three of the world’s biggest lines. Cheaper container rates are a boon for firms engaged in international trade, and their customers. But there is a risk that the benefits will not last. 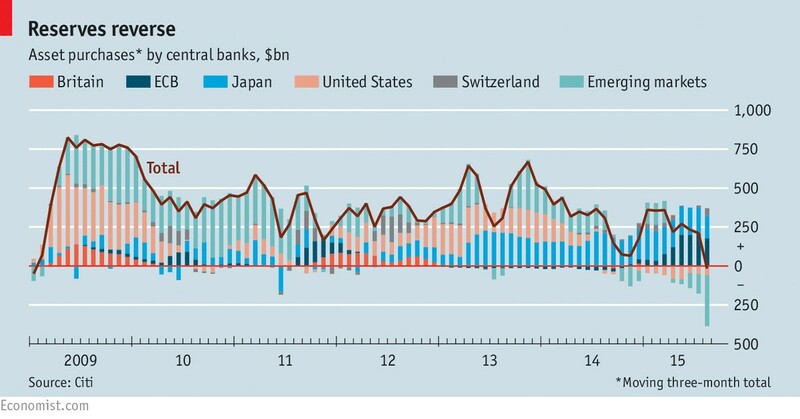 This has sparked warnings that the world faces a liquidity squeeze from dwindling reserves. When central banks in China and elsewhere were buying Treasuries and other prized bonds to add to their reserves, it put downward pressure on rich-world bond yields. Running down reserves will mean selling some of these accumulated assets. That threatens to push up global interest rates at a time when growth is fragile and financial markets are skittish. Analysts at Deutsche Bank have described the effect as “quantitative tightening”. In principle, rich-world central banks can offset the impact of this by, for instance, additional “quantitative easing” (QE), the purchase of their own bonds with central-bank money. In practice there are obstacles to doing so.Controlling for the range of things that influence interest rates, from growth to demography, economists have attempted to gauge the impact of reserve accumulation. Francis and Veronica Warnock of the University of Virginia concluded that foreign-bond purchases lowered yields on ten-year Treasuries by around 0.8 percentage points in 2005. A recent working paper by researchers at the European Central Bank found a similar effect: increased foreign holdings of euro-area bonds reduced long-term interest rates by about 1.5 percentage points during the mid-2000s.One explanation is that domestic variables outweigh foreign ones. Bond-buying by the Federal Reserve during its QE programed in 2008-14 mattered more in setting America’s long-term interest rates than increased reserve allocation by foreign central banks. In the past half year, the European Central Bank’s QE has had a dampening effect on euro-area yields. This suggests that changes in foreign-exchange reserves are not an insurmountable force. To the extent that a decline causes unwanted tightening, central banks in the rich world can counter it by buying bonds. Then again, although asset sales by central banks in emerging markets now exceed purchases by their counterparts in the rich world (see chart), the Fed shows little appetite to resume QE.Lost and foundBut even these concerns may be overdone. Reserves are not the only determinant of domestic money supply. Central banks soaked up much of the money created when they initially accumulated reserves, thus “sterilising” the impact. They can now undo that, for instance, by lowering the amount of money banks must keep at the central bank, as China has been doing. And just as central banks in the rich world use open-market operations—buying and selling domestic assets on a daily basis—to influence short-term interest rates, so can those in the developing world. Such operations require skill and deep capital markets, however. WHEN the bottom finally fell out of America’s housing market in 2006, it triggered the worst global recession since the 1930s. But rising house prices need not spell disaster. The Economist’s latest round-up of house prices across the globe shows that prices have risen over the past year in 21 of the 26 economies we track, at a median pace of 4.7% (see table). Not every rise is alike, however.Not for long, perhaps. Activity is buoyant: sales of existing homes increased by 6.2% on the previous year. With 30-year fixed-rate mortgages at record lows, the effect of an interest-rate rise on the housing market is expected to be minimal. 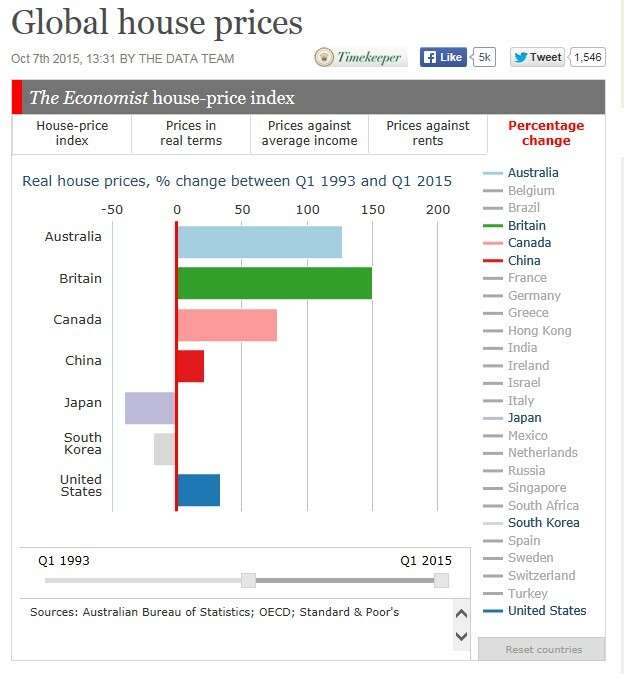 Other countries’ housing markets are already well above fair value. Taking an average of our two measures, houses are more than 30% overvalued in six markets. Britain is perhaps the most supply-constrained of this group. Although prices have risen by 35% since their trough in January 2009, housebuilding is failing to respond. Just 140,000 homes were completed in the year to March 2014, some 25% below the long-term norm. That puts a firmer floor under prices than in other notably overvalued markets such as Canada and Australia.Hong Kong is the most extreme example of soaring prices and limited supply. Property prices in the territory appreciated by 21% in the year to June, and have now doubled in five years. Since 2009 the regulator has introduced seven rounds of “macro-prudential” measures designed to cork the rises. Its latest, in March this year, reduced the average loan-to-value ratio for new mortgages from 64% to just 52%. In practice, China’s recent stock market crash is likely to be a bigger dampener on demand, as wounded mainland investors put off new purchases. Explore the data in our interactive chart below (updated on October 6th 2015) and try to spot which market is looking most vulnerable. 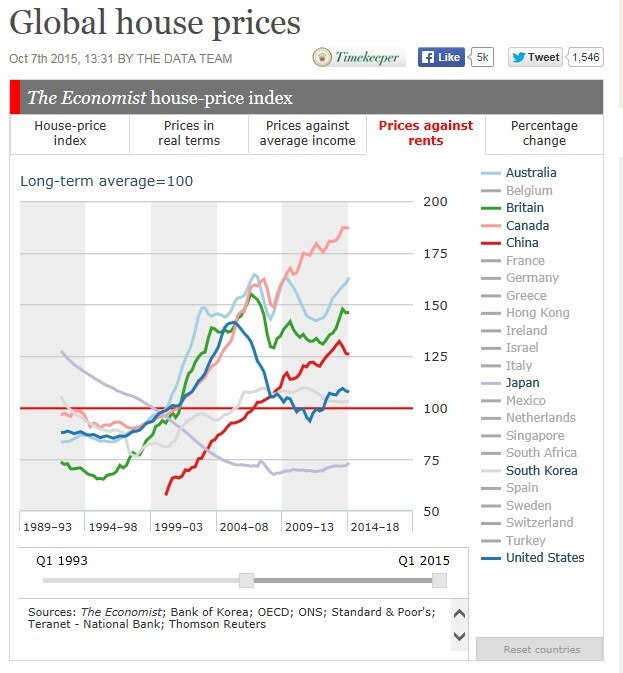 See full the article on global house prices here. What is more, construction is lagging. The National Association of Realtors, a trade body, has found that new house-building is failing to keep pace with job creation in many cities. For every 12 jobs created builders have historically gained construction permits for ten new homes. Between 2012 and 2014 that number fell to 4.8 permits. Some cities are sizzling again as a result: prices in San Francisco increased by 10% in the year to July, and are up by 75% since 2009. America is still—just—in the category of countries where the housing market remains in recovery. 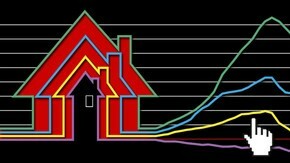 House prices there increased by 4.7% in the 12 months to July, according to the Case-Shiller national index. Prices have now risen by 25% from their 2011 trough, but still remain 7% from their 2007 peak. The Economist measures national affordability by comparing prices to the long-run average of their relationship with rents and income. 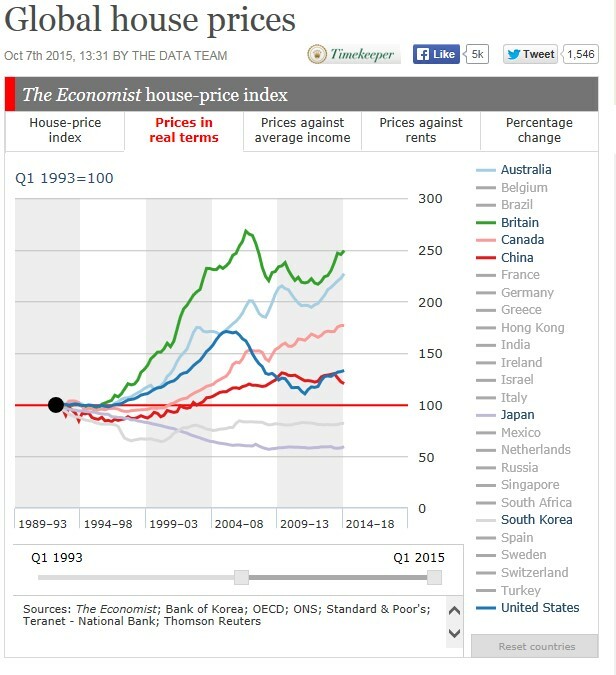 On this basis, we reckon house prices in America are broadly at their fair value. Not for long, perhaps. Activity is buoyant: sales of existing homes increased by 6.2% on the previous year. With 30-year fixed-rate mortgages at record lows, the effect of an interest-rate rise on the housing market is expected to be minimal. 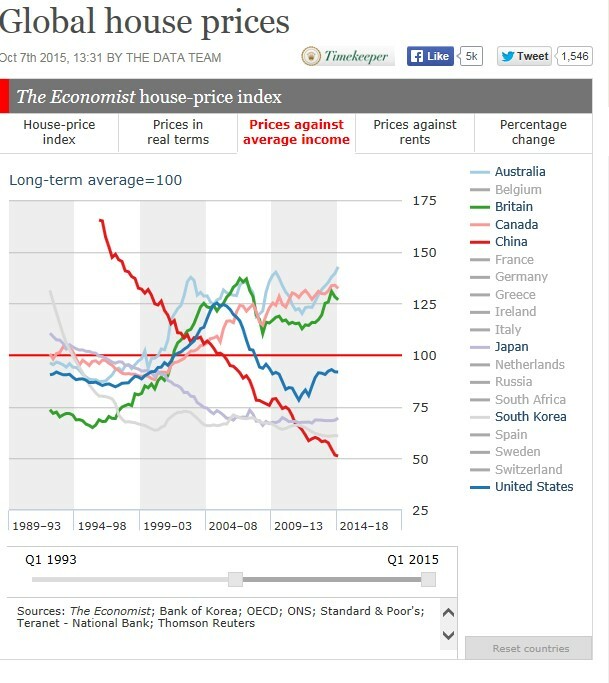 Other countries’ housing markets are already well above fair value. Taking an average of our two measures, houses are more than 30% overvalued in six markets. Britain is perhaps the most supply-constrained of this group. Although prices have risen by 35% since their trough in January 2009, housebuilding is failing to respond. Just 140,000 homes were completed in the year to March 2014, some 25% below the long-term norm. That puts a firmer floor under prices than in other notably overvalued markets such as Canada and Australia. Hong Kong is the most extreme example of soaring prices and limited supply. Property prices in the territory appreciated by 21% in the year to June, and have now doubled in five years. Since 2009 the regulator has introduced seven rounds of “macro-prudential” measures designed to cork the rises. Its latest, in March this year, reduced the average loan-to-value ratio for new mortgages from 64% to just 52%. In practice, China’s recent stock market crash is likely to be a bigger dampener on demand, as wounded mainland investors put off new purchases. As for China’s own housing market, it is one of only five in our index where prices are falling, joining Singapore and a trio of euro-zone countries—France, Greece and Italy. Prices are falling at a slower rate than before, however. The government has been trying to boost the market over the past ten months, cutting interest rates by 1.4 percentage points and relaxing rules on down payments. Prices are now rising on a monthly basis in many cities. In Beijing and Shanghai, they look positively frothy again. TOKYO Japan’s annual export growth slowed to a crawl in September as shrinking sales to China hurt the volume of shipments, raising fears that weak overseas demand may have pushed the economy into recession.Ministry of Finance data showed exports rose just 0.6 percent in the year to September, against a 3.4 percent gain expected by economists in a Reuters poll.That was the slowest growth since August last year, following the prior month’s 3.1 percent gain. The weak yen helped increase the value of exports, but volume fell 3.9 percent, the third straight month recording an annual decline. Wednesday’s data was the first major indicator for September and is part of the calculation of third quarter gross domestic product. A third quarter contraction would put Japan into recession, following the second quarter’s negative GDP result, and could force policy makers to offer further stimulus.”Given this data, the economy probably contracted about an annualized 0.5 percent in July-September. External demand, capital spending and inventory investment were a likely drag, while consumption picked up,” said Koya Miyamae, senior economist at SMBC Nikko Securities.China’s slowdown and soft domestic demand weighed on factory output and the broader economy, although the Bank of Japan saw the effects of China’s slowdown as limited for now, sticking to its rosy growth outlook.Still, weak indicators will keep the central bank under pressure to ease policy again to hit its ambitious 2 percent inflation target next year.Some analysts expect the BOJ to move at its Oct. 30 monetary meeting, when it also issues long-term economic and price projections. “Weak exports were within the BOJ’s expectations so this data alone could not be a trigger. But there’s no doubt that pressure will mount on the BOJ to act if weakness persists,” said Taro Saito, senior economist at NLI Research Institute. Separate data by the BOJ, which captures trade movements in real terms by eliminating price effects, showed real exports rose 0.2 percent in July-September while real imports grew 2.6 percent. This suggests net exports weighed on third-quarter GDP, said Yuichiro Nagai, economist at Barclays Securities Japan. YI GANG, a deputy governor of China’s central bank, mused this week about shopping in Moscow in the 1980s. In the streets around Red Square, he said, visitors could find many big shops with identical low-quality goods. But among the drab displays were a few Yugoslav and Polish stores with better selections. These countries had experimented with competition earlier than the Soviet Union and the results were visible on the shelves of their outposts in Moscow.Banks, Mr Yi suggested, are no different from stores. If governments control them too tightly—as China has long done by dictating the interest rates they pay and charge—banks do not compete with each other and thus fail to develop the range of financial products their customers want and need. So on October 23rd, at the same time as cutting interest rates to support stuttering growth, the People’s Bank of China (PBOC) announced that it was setting banks free. They can now offer depositors whatever interest they like, at least in theory. That removes the last formal restriction on rates. Progress will be gradual, however. The central bank will continue to publish benchmark deposit and lending rates. Although banks are no longer obliged to stick to them, the big, state-owned ones that dominate the financial system tend to hew closely to official guidance. 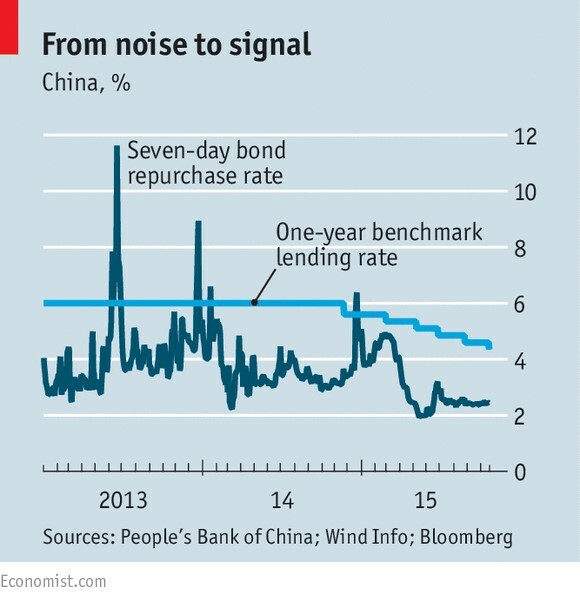 Eventually, the PBOC says (without specifying when), it will stop publishing benchmark rates. Its approach would then resemble that of its counterparts in developed countries, which seek to influence rates through their own borrowing and lending, rather than by decree. The full liberalization of interest rates should, in theory, change the face of China’s financial system. By keeping rates well below where they would have settled in a free market, the government transferred wealth from savers to banks and to borrowers. Banks benefited because regulators created a large gap, about three percentage points, between savings and lending rates, guaranteeing them easy profits when turning deposits into loans. This made them rich but lazy. Borrowers did well because lending rates were also held artificially low, providing them with cheap credit to fuel China’s investment boom. But savers—workers stashing a share of their hard-earned wages in their accounts—earned paltry returns. “Weak exports were within the BOJ’s (Bank of Japan) expectations so this data alone could not be a trigger. But there’s no doubt that pressure will mount on the BOJ to act if weakness persists,” said Taro Saito, senior economist at NLI Research Institute. Still, weak indicators will keep the central bank under pressure to ease policy again to hit its ambitious 2 percent inflation target next year. “Given this data, the economy probably contracted about an annualized 0.5 percent in July-September. External demand, capital spending and inventory investment were a likely drag, while consumption picked up,” said Koya Miyamae, senior economist at SMBC Nikko Securities. Ministry of Finance data showed exports rose just 0.6 percent in the year to September, against a 3.4 percent gain expected by economists in a Reuters poll. China’s economy grew at its weakest pace in six-and-half years in the third quarter, but beyond the headline number, analysts see signs of rebalancing. GDP growth in the third quarter beat market expectations slightly, expanding by 6.9 percent, the National Bureau of Statistics said on Monday. Quarter-on-quarter, the economy grew by 1.8 percent, unchanged from the second quarter. However, the expansion is the weakest since the first quarter of 2009, with Sheng Laiyun, spokesman for the bureau, attributing the slowdown to weak external demand and a reduction of inventory in traditional industries such as cement and steel. But rebalancing is evident, and while traditional growth engines sputter, consumption and services are holding up, offsetting the slack. Industrial output in September slowed further to 5.7 percent from 6.1 percent in August, while fixed-asset investment growth－a key driver of the economy－fell further to 10.3 percent in the first nine months. Real estate investment was a particular drag on the economy, slowing to 2.6 percent in the first nine months, down from 12.5 percent recorded in the same period a year ago. For the first time, service industries comprised more than half (51.4 percent) of GDP, 10.8 percentage points ahead of manufacturing. From January to September, spending on consumption contributed 58.4 percent of growth, compared with 49.1 percent a year ago. Retail sales strengthened from 10.5 percent in July to 10.9 percent in September. 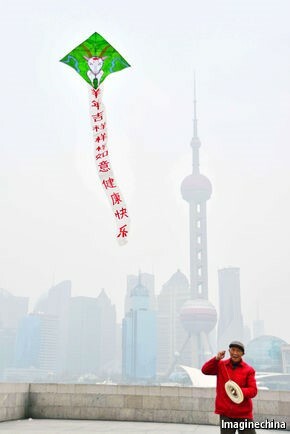 Premier Li Keqiang said on Monday that expansion of 6.9 percent is in line with the government’s annual growth target. “The Chinese economy is running smoothly … the government has provided adequate employment. …Our goal to achieve around 7 percent annual growth this year can be achieved, and that will provide a stable outlook for the market,” Li said. Tom Orlik and Fielding Chen, Bloomberg economists, noted that growth had avoided a hard landing because “a resilient service sector shrugged off the stock market crash and offset continued weakness in industry”. Economists cited accelerated loan growth as evidence that economic expansion may stabilize in coming months. Most economists expect the central bank to cut interest rates by another 25 basis points and to lower the reserve requirement ratio by 50 to 100 basis points by the end of the year. Global financial services providers expect the Chinese currency can achieve full convertibility in about five years, a report from the Economist Intelligence Unit said on Friday. The report, titled “A delicate stage: The future of the renminbi as a global investment currency”, surveyed more than 200 senior executives from financial institutions both in China and abroad about the long-term future of the yuan as an investment currency. Around 63 percent of respondents in China and 78 percent from overseas think that the yuan will become fully convertible and tradable without restrictions in five years’ time. Majorities of both groups believe it will take slightly longer, seven to 10 years, for the yuan to become a global investment currency, said the report. According to the British think tank, 60 percent of respondents in China believe the yuan will surpass the US dollar as the world’s most commonly used currency within the next decade. This research, sponsored by UK Trade and Investment, also highlights the remaining challenges financial institutions face in addressing regulatory change and legal uncertainty. “Despite recent market events, global financial services firms see onshore equities as one of the fastest growing international yuan business areas over the next three years,” it said. Wu Chen, editorial director of the Economist Global Business Review, pointed that financial service companies expect their yuan business and revenues to soar. “In the UK we have already seen recognition of this, with increasing numbers of partnerships between UK and Chinese firms and an open business environment that fosters innovation,” she added. Helen Wong is chief executive officer for Greater China at the Hongkong and Shanghai Banking Corp. Ltd. and member of the board of directors for HSBC Bank Canada. After decades of supercharged growth, China’s economy is now growing at a more moderate pace. But given its sheer size, even less-than-rapid growth generates plenty of opportunities for Canadian corporations that cater to the changing needs of the world’s second-largest economy. China’s economic transformation over the past 35 years has been rapid, far-reaching and multifaceted. In 1978, the year before Beijing began to reform and open up the Chinese economy, the country was home to 22 per cent of the world’s population, but was responsible for just 5 per cent of the world’s economic output. By 2014, its share of the global population had slipped to 19 per cent, but its share of global gross domestic product had soared to 13 per cent. Many of China’s 1.36 billion citizens have become wealthier as a result. As recently as 2000, just 4 per cent of China’s urban households were considered middle-class. By 2012, that share had soared to 68 per cent. Although Chinese private consumption as a percentage of GDP is much lower than that of most other major economies, it has been rising rapidly. Last year, U.S. online sales on Black Friday and Cyber Monday, at a combined $4.2-billion, were dwarfed by those in China on Nov. 11, better known as “Singles Day.” Chinese shoppers spent $9.3-billion that day, three times more than just two years earlier. These changes have brought tremendous opportunities for foreign businesses, which, in the decades after China opened up to global trade and investment, seized on the country’s low-cost manufacturing prowess to source and manufacture goods for markets around the world. From 2008 to 2013, the value of Canada’s exports to China increased at an average annual rate of 14.4 per cent, while the value of Canada’s imports from China rose an average of 4.3 per cent each year. China is now Canada’s second-largest source of imports as well as its second-largest export market. However, China-Canada bilateral trade accounts for only a small part of both countries’ total foreign trade, so there is room for growth. Canadian commodity exporters, in particular, benefited from China’s ravenous appetite for metals and other raw materials and energy. China’s cooling growth has dulled that demand of late, but this does not mean that business opportunities have dried up. The “new normal” in China means more realistic, sustainable expansion, where the emphasis is on the quality of growth, rather than its sheer speed. The goal is to reduce the old reliance on exports and low-value-added manufacturing, and increase the role of domestic consumption, private-sector activity and services, which now make up a bigger part of the economy than manufacturing. While old-style manufacturing will not disappear, the government is making big efforts to move China’s manufacturing capabilities to the next level. Policies such as “Made in China 2025,” announced in May, promote advanced industries such as information technology, robotics, aerospace, railways and electric vehicles. This presents opportunities for Canadian business. Take urbanization. Despite the massive migration to China’s cities, the urbanization rate lags that of other countries at similar levels of development. The government’s target is to have 60 per cent of China’s population living in cities by 2020. That means a continued, big need for investment in urban infrastructure – from subways, water-treatment systems and waste-management facilities to building technologies and airports. Bombardier, for example, is close to sealing an order from a Chinese lessor for its biggest-ever jet. The company is forecasting the need for 2,450 commercial aircraft in China – deemed a “major opportunity” – in the 60-to-150-seat segment over the next 20 years, with deliveries to Greater China representing 19 per cent of the world’s total demand. On the consumption front, the stars remain aligned for robust growth for many years to come. The days of double-digit economic growth may be over, but salaries are still rising. While consumer appetite for some goods or brands may have dropped off, a lot of cash is simply shifting to other product categories or will be deployed a little later. As Chinese consumers become wealthier, they will continue to buy iPhones, send their kids to universities in the West, travel to Toronto or Vancouver. China has emerged as Canada’s second-largest source of overseas visitors this year. The recent stock market volatility has not put a stop to consumer spending. Retail sales data for August showed an increase of 10.8 per cent from a year earlier – more than analysts had expected. Meanwhile, Beijing’s goal of boosting private-sector activity, increasing the service sector and raising living standards will bring new business opportunities in sectors such as financial services and health care. Health-care spending alone is estimated to grow to $1-trillion in 2020 from $357-billion in 2011, according to McKinsey – and the government has signalled that foreign investment will have a role to play. China is not an easy market, and the days when companies could record easy, double-digit annual growth are over. Foreign companies doing business in China have to be nimble, to be able to adapt to the constantly changing spending preferences of Chinese consumers and to be prepared to deal with periodic stock-market volatility. For those who do so, China will continue to be a must-be location and key export market. IN MOST respects, double-digit growth is a relic of the past for China. In the third quarter the economy grew by just 6.9% year-on-year according to official data, and probably by a percentage point or two less in reality. Yet bank loans increased by 15.4% in the third quarter compared with the same period in 2014. Having released a torrent of credit to buoy the economy during the financial crisis, China was supposed to have started deleveraging by now. Instead, banks are continuing to pump debt into the economy, while the authorities, apparently worried about the damage a contraction in credit might do, coax them on. This means that China’s overall debt-to-GDP ratio is continuing its steady upward march (see chart). Debt was about 160% of annual output in 2007. Now, China’s debt ratio stands at more than 240%, or 161 trillion yuan ($25 trillion), according to calculations by The Economist. It has risen by nearly 50 percentage points over the past four years alone, with slowing growth only serving to magnify indebtedness. A rapid increase in debt in a short space of time has historically been a good predictor of financial trouble, from Japan in the 1990s to southern Europe in the 2000s. But there is no level that automatically triggers crises. Since most of China’s debts are held within the government-controlled bits of its economy (state-owned firms are the biggest debtors and state-owned banks their biggest creditors), the country has the means to avoid an acute crisis. It can, in effect, roll over bad loans as they come due or abstain from calling them in. However, although that spares the economy short-term pain, it leaves it with a chronic ailment. Ever more credit is needed to sustain growth. Loans that should have gone to sprightly companies with promising new ideas go instead to corporate zombies. There are worrying signs that China is heading in this direction. In the six years before the global financial crisis, each yuan of new credit brought about five yuan of national output. In the six years since the crisis, that has fallen to just over three yuan. It is not hard to find examples of companies on life support that in other countries might have perished by now. In September China National Erzhong Group, which makes smelting equipment, received a bail-out from its parent. Investors in Sinosteel, a metals conglomerate, are now hoping for the same after it delayed payment on a bond this week. It is not too late for China to bring its debts under control. Regulators have taken steps in the right direction. They have obliged local governments to provide better data on their debts and have forced banks to bring more of their shadow loans onto their balance-sheets, providing a clearer picture of liabilities. One reason that banks have been issuing loans so quickly this year—faster than overall credit growth—is that they are replacing shadowier forms of financing. China has also used both monetary easing and a giant bond-swap programme for local governments to reduce the cost of servicing debts. The weighted interest rate on existing liabilities has fallen from roughly 6% to 4.5% this year. But some worry that these measures are just pushing risks elsewhere. A bond-market boom is the newest concern. Net bond issuance in the first nine months of 2015 reached 8.7 trillion yuan, up 67% from the same period a year earlier. At the same time, the gap between funding costs for companies and the government has narrowed sharply. The one-year yield on government bonds has fallen by nearly a percentage point over the past year, whereas corporate yields have fallen by 1.5 percentage points. In other words, investors are lending to companies as if they were becoming safer borrowers, even as their liabilities increase. Yang Chen of Bank of America Merrill Lynch notes that some investors are buying bonds with borrowed cash, believing that the government will wade in to spare them from any big defaults—as it has done in the past. If that impression persists, China’s debt mountain could grow bigger still. IN 1953, taking cues from their Soviet advisers, Chinese leaders launched their first five-year plan. They charted a course for rapid industrialization of the then-agrarian country. Now they are drafting their 13th such document. It will show how much has changed. Its main message will be that industrialization has run its course and that China will have to find a new engine of growth. But the very existence of the plan (to run from 2016 to 2020) is indicative of how, in economic policymaking, much has stayed the same. China will publish the first outline after an annual meeting of the Communist Party’s Central Committee at the end of October. It will be very different from the party’s early plans. It once set specific production targets for steel and grain, among other things—hallmarks of the central planning that led China so astray. Since the early 1980s, the role of the plans has been relaxed. They clarify medium-term policy priorities, but are not blueprints that must be adhered to slavishly. Yet the plans are still important, not least because of the attention they receive. “They are large neon signs of where the party wants to take the country,” says Scott Kennedy of the Centre for Strategic and International Studies, a think-tank in Washington. Local officials scurry to adjust their rhetoric and policies to fall in line with the plan. Banks direct capital to the industries the plan seeks to boost. Companies, both state-owned and private, alter their business models accordingly. In recent years, the plans have come to encompass a wider range of priorities. Almost all the binding targets in the current one relate to the environment or social welfare. Officials were obliged to build 36m units of public housing, limit energy use and expand primary-school enrolment—all of which they accomplished, albeit sometimes by fiddling the numbers. Purely economic targets such as income growth and job creation were considered predictive, not mandatory. This could have big implications for economic policy. The farther growth slips below target, the more the government will be under pressure to stimulate the economy or, failing that, to doctor data. Given China’s already-heavy debt burden (see article) and analysts’ abiding cynicism about official statistics, neither outcome would be welcome. Some economists have called on China to abandon its growth target altogether, to give itself more breathing space. But Kuang Xianming of the China Institute for Reform and Development, a think-tank, says the GDP figure will remain in the plan, because it serves as a lodestar for all other economic policies. There will be plenty of other targets to aim for. Just over 70m people still live under the official poverty line; the plan is likely to include a pledge to expand welfare payments to lift them all above it. The government has already started to relax its one-child policy; some believe the aim in the next five years will be to abolish it altogether. There will probably be objectives for reductions in carbon emissions, investment in high-tech industries and the building of megacities. Full details will not be released until March, when China’s parliament approves the plan. Perhaps the most intriguing element is one that will remain unmentioned by state media: the historic milestone of the new document. Such plans are one of China’s cherished inheritances from the Soviets. But the Soviet Union collapsed before it was able to see its 13th one to completion. Beating the Soviets may provide China’s party with a bigger-than-usual incentive for the rest of the decade. Staff members of the Industrial Economics and Knowledge Center yesterday hold a news conference in Taipei, predicting that the recovery of Taiwan’s manufacturing industry would be slow next year. The production value of Taiwan’s manufacturing sector is expected to contract 7.36 percent on an annual basis this year as demand from China slows, the Industrial Economics and Knowledge Center (IEK) said yesterday. The decline would be the steepest since the global financial crisis in 2009 and the forecast is far greater than the 1.74 percent decline IEK projected in August. “China’s economic weakness has afflicted its global trade partners, especially Taiwan, South Korea and Southeast Asian countries,” IEK senior researcher Peter Chen (陳志強) told a news conference. China on Monday reported 6.9 percent annual growth in GDP for last quarter, dipping below 7 percent for the first time in six years. IEK expects Taiwan’s manufacturing sector’s output to expand just 0.87 percent from an estimated NT$17.59 trillion (US$540.26 billion) this year to NT$17.75 trillion next year. Chen said that the local manufacturing sector would be unlikely to return to growth until the second quarter of next year, while the nation needs to solve a long-term problem of upgrading its industry structure to higher-margin businesses. The production value of information technology hardware, a major pillar of Taiwan’s economy, is expected to grow 1.9 percent next year to NT$6.1 trillion, an improvement from an estimated 0.6 percent contraction this year, Chen said. However, production value of the basic metal and machinery segment, the second-biggest contributor to manufacturing output, is expected to shrink by 2.2 percent to NT$4.61 trillion next year, compared with this year’s 9.2 percent decline, IEK said. The center blamed steel overcapacity in China for the slow recovery of the basic and machinery segment, and industry players agree. “The machine tool industry’s outlook is bleak. We expect the decline to exceed IEK’s forecast in the fourth quarter and the whole year of this year,”said Carl Huang (黃建中), secretary-general of the Taichung-based Taiwan Machine Tool and Accessory Builder’s Association. “We do not expect to see a significant improvement until the third quarter of next year,” Huang said. China is the biggest export destination for Taiwanese machinery goods, receiving more than 30 percent of the sector’s overseas shipments. The production value of the machinery tool sector is expected to drop by 10.4 percent to NT$135.2 billion this year and decline by another 2.1 percent next year to NT$132.5 billion, IEK said. The petrochemical sector is expected to see growth in production value of 3 percent annually to NT$4.61 trillion next year, reversing an annual decline of 16.7 percent this year, thanks to steady global crude oil prices, the center’s data showed. Taiwan’s industry, including tourism, is expected to be flat in terms of production value next year due to the sluggish economy. IEK forecast that the industry’s production value could rise 0.6 percent to NT$2.43 trillion next year after growing 0.5 percent this year. NEW trade figures from South Korea on September 1st surprised even the gloomiest of economic forecasters. The country’s exports shrank by the largest annual amount in six years, down 14.7% last month from a year earlier to under $40 billion, according to the ministry of trade, industries and energy. Few analysts had expected more than a 6% drop: though exports have dropped every month since January, they declined just 3.4% in July in annual terms. Morgan Stanley, an investment bank, tempered its growth forecast for South Korea down to 2.3% from 2.5% for the year. Exports account for roughly half of South Korea’s GDP—and a quarter of all those go to China, its biggest trading partner. South Korea has been struggling with the rise of its currency, the won, against the Japanese yen in key export markets; now China’s successive devaluations have started to bite. Provisional figures released today showed that South Korean car shipments dropped steeply in August, by nearly a third. Though exports of smartphones rose, fast-rising Chinese handset makers are increasingly vying with Samsung Electronics of South Korea for global market share (its profits have dropped for five consecutive quarters). A weaker yuan is also keeping holidaying Chinese shoppers away—just as the country attempts to woo them back after an outbreak of Middle East Respiratory Syndrome (which infected 186 and killed 36) hit South Korea in May. Low global oil prices are also behind the startling figure. Petroleum products are a key South Korean export, and their price has dropped by over 40% from last August. The ministry of trade today pointed to this distortion to downplay concerns that falling exports might presage serious weakness in the domestic economy; by volume, it said, total exports actually grew by 3.8% in August from a year earlier. The ministry also argued that local manufacturers ought to be more profitable given the lower cost of importing raw materials. Only last month the finance minister, Choi Kyung-hwan, argued that a weak yuan could be a boon: if Chinese exports increased, so too would demand for intermediate goods, such as electronic components, which make up the bulk of South Korea’s exports to China. Market watchers are less sanguine. Frederic Neumann of HSBC, a bank, says the plunge is “pretty serious”, not least because South Korea has “long been a reliable bellwether” for global trade. South Korean manufacturing sits at the top of the production chain, he says: a big chunk of its exports do indeed go into other finished goods, like Chinese smartphones and American laptops. But if demand slows there, so do requests for chips and screens. That means that Korean macroeconomic data “picks up very early changes in the global industrial cycle”. Neither is a slowdown in China the only source of export weakness; South Korea’s exports to the euro area plunged by 21%, more than twice the decline in exports to China. Recent figures show that the economy expanded by a feeble 0.3% from April to June compared to the previous quarter: its weakest gain since 2009. The government has already cut its growth target from 3.8% to 3.1% since January; for its part the Bank of Korea has been cutting its key interest rate, now down to an all-time low of 1.5%. Ever more analysts expect South Korea’s central bankers to shave it again soon, and perhaps even as early as next week, when they gather for a policy meeting on September 11th. If South Korea’s bellwether status is anything to go by, central bankers elsewhere ought to be paying attention as well. THE prospects for a summit between the leaders of China, Japan and South Korea had appeared bleak since an annual chin-wag, begun in 2008, was called off in 2013 over worsening territorial spats (between China and Japan, and between South Korea and Japan) and over accusations by China and South Korea that Japan was not facing up to its wartime past. Yet on March 21st the countries’ foreign ministers met for the first time in three years and agreed to push for a resumption of trilateral summits as soon as “convenient”. In a fraught region, this counts as progress. In the meeting in Seoul, the South Korean capital, China’s foreign minister, Wang Yi, claimed that three-way co-operation had been put “back on a normal track”. It was the result of diplomatic shuttling and a cooling of tempers. In particular, a studiously sullen handshake in Beijing in November between President Xi Jinping of China and Shinzo Abe, Japan’s prime minister, helped unfreeze relations between those two countries after China had challenged Japan’s control of the Senkaku islands (Diaoyu in Chinese) and Mr Abe had visited Tokyo’s Yasukuni shrine with its militarist overtones. Chinese incursions into the waters surrounding the Senkakus have not decreased. But at least the two sides are discussing a military hotline and the incursions follow a choreographed routine. On March 19th they held their first high-level security talks in four years. More broadly, day-to-day relations between them have improved dramatically. The talks in Seoul have now evinced a broader recognition that grievances must not be left to overshadow essential economic relationships. Common ground was found on disaster management, tourism, trade, the environment and ageing societies. A senior Japanese official said that President Park Geun-hye of South Korea had shown leadership in helping to broker the meeting. Strikingly, the three ministers also came up with a tripartite statement on North Korea’s threatening nuclear ambitions. Yet at least Mr. Abe has pledged to stand by previous official anniversary apologies. He has appointed a panel to come up with some consensus on history matters in time for his expected statement on August 15th. The panel’s members expect no consensus, but they do hope their deliberations will foster a wider public debate. As for the expected statement, that is up to Mr. Abe alone. Shen Dingli of Fudan University in Shanghai says that China is unlikely to take bolder steps, including towards a three-way summit between Mr. Xi, Mr. Abe and Ms. Park, until it hears what Mr. Abe has to say. America also wants to know. It may get a better sense when he visits Washington at the end of April, becoming the first Japanese prime minister to address a joint session of Congress. The template of his speech is likely to be one he delivered to Australia’s Parliament in Canberra in November, in which he offered his “sincere condolences” for the horrors of the war. But it is easier to say sorry to your friends. America is certainly pleased by improving ties between its two Asian allies, South Korea and Japan. Tension between them, it says, has been a “strategic liability”. Yet Ms. Park is vacillating on another front that concerns America: accepting its advanced anti-missile defense system (known as THAAD, or Terminal High Altitude Area Defense). Though ostensibly designed to counter North Korean aggression, China has expressed displeasure to South Korea—fearing it may also be used to contain China. Despite their tentative rapprochement in Seoul, there is much still trying to pull Japan, South Korea and China apart. NEW DELHI: Projecting stable growth rate for India, Moody’s Investors Service today said the economy would grow at 7.5 per cent in the current fiscal and improve marginally in the following year. “We expect that India’s real GDP will grow at 7.5 per cent in the financial year ending March 31, 2016 (FY16) and 7.6 per cent in FY17. “These growth rates would be slightly faster than the 7.4 per cent recorded in FY15 and substantially better than from FY12 to FY14,” it said in a r ..